DETROIT — To celebrate the back to school season, Comerica Bank today announced it will serve as the first corporate contributor to launch a Transportation Fund through the Detroit Public Schools Foundation to support student field trips within Detroit Public Schools. The announcement was made at John R. King Academic and Performing Arts Academy in Detroit. The initial contribution of $10,000 will support transportation to approximately 40 field trips and competitions and impact approximately 2,000 DPS students. This contribution also serves to kick off the DPS Foundation’s Annual Appeal Campaign, this year corresponding with back to school season and aptly named Give Back to Detroit Schools. The annual fundraising drive runs through Oct. 31 and aims to raise thousands of dollars to support value-added programs and activities for the benefit of the Detroit Public Schools, DPS-authorized charter schools, DPS schools placed in the Education Achievement Authority and their respective students. “We thank Comerica Bank for its generous contribution to this much needed Transportation Fund. Comerica is the first of what we hope will be many organizations contributing to the fund to help further the education of DPS students,” said Glenda Price, incoming president, Detroit Public Schools Foundation. 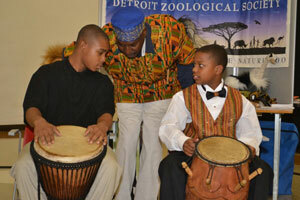 In addition to supporting the Transportation Fund, Comerica is supporting students from elementary through high school by sending the first field trip of elementary students from John R. King Academic and Performing Arts Academy to the Detroit Zoo to experience the African Adventure Stories program, which was made possible in part through a grant from the Comerica Charitable Foundation. Students will hear true stories from the Zoo’s Education Specialist, David Gakure, about growing up and being a safari guide in rural Africa, as well as view the animals featured in the stories as they tour the grounds. Comerica is also creating an educational opportunity for high school students by providing funds to transport them to Michigan College Access Network’s Detroit College Night at Detroit’s Youthville. For more information including how to support the Give Back to Detroit Schools campaign or the Transportation Fund, visit www.detroitpsfoundation.org.